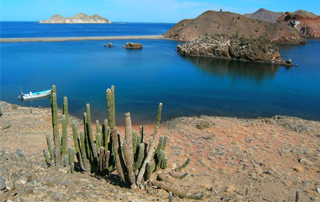 Come experience the natural beauty of the Sea of Cortez, the place that Jacques Cousteau dubbed "The Aquarium of the World"
Bahia de los Angeles is a small fishing village of 1000 people that lies nestled between the rugged Sierra San Borja Mountains and the sparkling waters of the Gulf of California. Located approximately 8 hours south of the U.S. border, Bahia de los Angeles offers a tranquil setting with a wide variety of activities for everyone in the family. Accomodations range from beach front palapas and moderately priced motel to house rentals and luxury suites. The surrounding desert is part of the Valle de los Cirios Biosphere Reserve and the 20-plus offshore islands are known as the "Galapagos of the North" for their unique species, some of which are found nowhere else on earth. It is the best time to do free Diving. You can watch and swim with the whale shark.